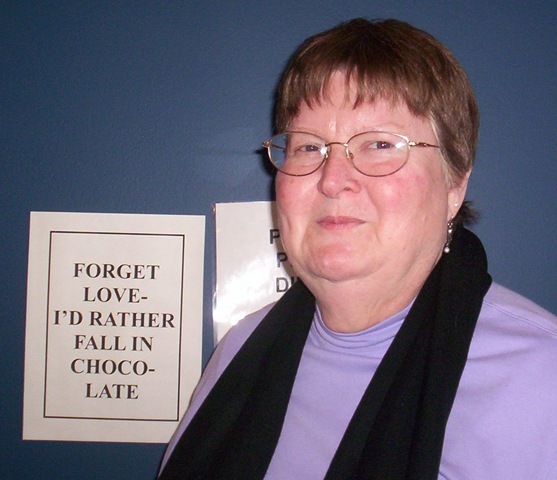 In May 2009, Nancy Hardesty was diagnosed with pancreatic cancer. And as 2011 began, we knew it had metastasized and was terminal. I had been thinking of telling the story behind our writing of the book for several years; but in view of Nancy’s cancer diagnosis, it became more urgent than ever that I do so without further delay. I wanted it to be a special tribute to Nancy. She and I talked at length about each part of this series , and she was delighted to read the installments as our story unfolded online, post by post. She would say she could hardly wait to read the next one. I had her permission to quote selectively from our lengthy correspondence, and we talked about the contents of the upcoming installments (Parts 7 and 8—and possibly more). We relived the memories together. I had hoped so much to finish the entire series on “Coauthoring All We’re Meant to Be” while Nancy was still with us, but it was not to be. 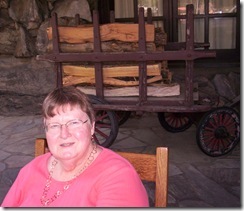 She died peacefully in her sleep, under hospice care in Atlanta, on April 8, 2011. She was 69 years old. It is hard to realize she is gone. We had been part of each other’s lives for over four decades. This past weekend, I almost expected her to call, as she so often did on Saturday or Sunday afternoons or evenings. We would each pour a cup of coffee and talk—most times for about three hours, sometimes even four (and at least once during this past year, five hours). It always seemed as though we were enjoying an in-person visit. At times, we would talk during weekdays or evenings as well. But there were other times when our lives would become so busy that we didn’t have a chance to phone each other for several weeks, although we might keep in touch with an email or two even then. As with most people today, electronic correspondence had gradually replaced the long, almost daily snail mail letters we had sent across the miles during the writing of our book. And the lengthy phone calls that became frequent during the past fifteen years or so were only made possible by unlimited long distance plans that would have been beyond our imagination at the time we wrote our book. Although Nancy and I lived far apart, with time and energy necessarily centered on our own separate lives and careers, we never stopped encouraging each other in our writing, editing, speaking, and teaching careers, as well as sharing our personal lives. Often when either of us needed advice or support, we knew it was only a phone call away. The same was true when we knew we had some special joy to share. 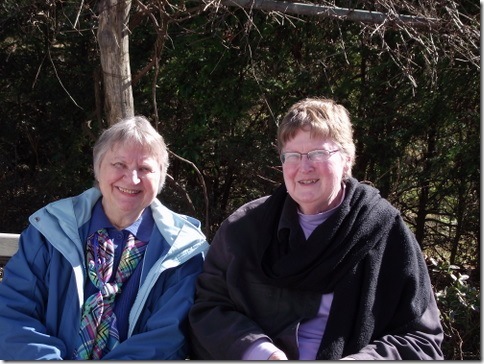 We each wrote numerous other books on our own and worked together on the various revisions of All We’re Meant to Be, and we worked as the planners and coordinators of the EEWC conference in Charlotte in 2006; but we never wrote another book together. I wish we had. Several years after Nancy began teaching religion in the Department of Philosophy and Religion at Clemson University in Clemson, South Carolina, both of my sons and families moved to different cities in the adjoining state of North Carolina. That provided another opportunity for getting together because I was able to combine family visits with a visit with Nancy, especially when I flew from Virginia to visit the son who lives in Asheville, North Carolina. Asheville was one of Nancy’s favorite places and only a little more than an hour’s drive from where Nancy lived in South Carolina. Any time that I visited Steve and Karen and the grandchildren in Asheville, we would arrange for Nancy to drive up the scenic route through the mountains so that she and I could spend a day together, beginning with a 9:30 a.m. breakfast in one of the Asheville restaurants (our favorite was The Early Girl Eatery with its fresh local foods directly from nearby farms). There, we’d catch up on each other’s news over a southern breakfast of eggs, homemade biscuits, country ham or bacon, and creamy grits that were out of this world (taking a break from worrying about calories and cholesterol). And of course lots of steaming coffee. Nancy especially liked their homemade jams and jellies on the delicious biscuits; I liked the honey. The rest of the day we would spend walking and driving around Asheville and visiting the city’s fascinating shops, looking at books, jewelry, scarves and shawls, art, crafts, and more. Or we’d stop and listen to street musicians. 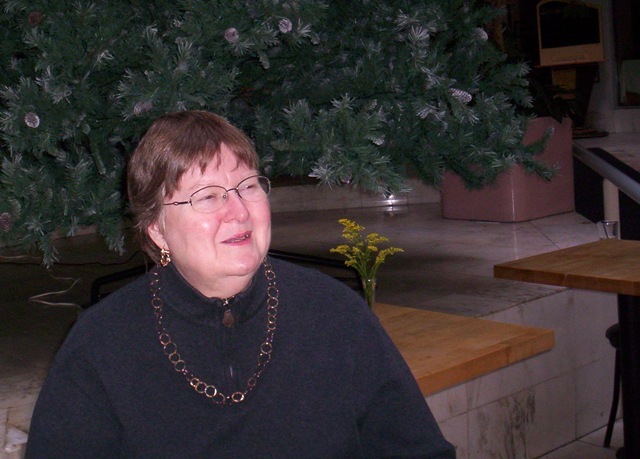 Then we’d take a break at a coffee or pastry shop in the afternoon, such as when I snapped this photo (left) of Nancy in front of some Christmas decorations in 2007. Just for fun, during our Thanksgiving 2005 get-together, I persuaded her to strike a comic pose in front of a humorous poster we found inside one of the coffee-and-pastry shops. I joked that we could have used that for her singles chapter. (See photo on right.) 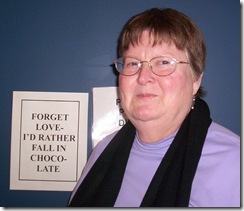 She had a marvelous sense of humor and we had lots of laughs together over the years. This sign provided one of those laughs. Sometimes, while she and I were exploring downtown Asheville, we would stop at the office of my daughter-in-law; and on one occasion, Karen arranged to meet Nancy and me for lunch at the Grove Arcade, The three of us had a long and delightful conversation, thoroughly enjoying each other’s company, as women friends do. We talked about that day long afterward. For our summer, 2008 “Asheville-day-together,” when I was there for my grandson Chris’s high school graduation, Nancy and I drove over to the famous Grove Park Inn and enjoyed some hammered dulcimer music in the large open lounge area and then sat on the rocking chairs on the front porch, conversing and watching the “real”guests coming and going. At the left is a photo indicating that the phrase, “Nancy rocked!” would be totally appropriate in so many ways. When we drove back to Steve and Karen’s house that day, we found them sitting on their front porch, along with some neighbors, and we joined right in and had a delightful time conversing, swapping stories, and enjoying some laughs. Most of the time when I was visiting North Carolina, however, it was around Thanksgiving or Christmas, and the weather was too cold to sit outside. At those times, after Nancy’s and my day of visiting the shops and restaurants of Asheville, we would join Steve and Karen (and sometimes some of the kids) around the kitchen table for more visiting together. She was very much a part of the family. As you can tell, I highly treasure the memories of these outings that Nancy and I enjoyed at least yearly and sometimes twice yearly. It is hard to realize those times have now ended. 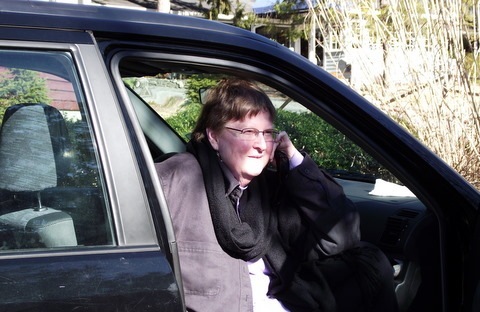 By the summer of 2010, Nancy knew she was dying—although it was not obvious from the outside. She told only a few of us who were closest to her. She went about her life as usual and told her oncologist how important it was that she attend the 2010 EEWC-Christian Feminism Today conference in Indianapolis. He arranged her chemo treatments to be worked around the conference dates. At the conference, she looked radiant, and only three of us knew the whole story. She did not yet want others to know what the tumor-marker blood tests and PET-scan were showing about the metastasizing of the cancer and the growing realization of the ineffectiveness of the treatment. She felt strongly about not permitting a cloud of sadness to be cast over a very joyful gathering. She led a workshop on spirituality, attended the plenary meetings and workshops, actively participated in the business meeting, and mingled with friends as her usual smiling self. In outward appearance and demeanor, she seemed no different than at any other time. After the conference, she fulfilled her responsibilities as a member of the EEWC-CFT Executive Council at its annual meeting, volunteering to continue another year as the council’s secretary as well as volunteering to serve on the planning committee for the 2012 conference (even though she told me privately that she knew the 2010 conference would be her last). And she signed up to write one of the upcoming Council Columns that appear in each issue of Christian Feminism Today. As editor of that quarterly publication, I remember feeling a sudden chill as I wondered if she would still be around for the winter (January-March) issue for which she had volunteered to be council columnist. Not only did Nancy write her column for that winter issue, but it morphed into an outstanding full-length feature article that provides a positive statement of faith and courage in the face of death—and article in which she forthrightly bared her soul and shared her feelings about what it’s like to know one is dying—and to face death unafraid. The article has touched many people through Christian Feminism Today magazine and is now reaching hundreds more through the EEWC-Christian Feminism Today website, where it is currently the most read article. Nancy had requested that I not post the article online until after she died, and I, of course, honored her wishes. I hope you will take the time to read “Some Thoughts on Living and Dying” and be inspired. The brief author bio included with the article provides information on some of Nancy’s other scholarly pursuits and publications after our completion of All We’re Meant to Be. At the time of her cancer diagnosis, she was researching and planning a book on the history of African American Christianity. 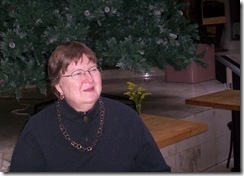 If you go to eewc.com to read her article, be sure to read in addition one of the last book reviews Nancy Hardesty did for us. I think you’ll appreciate her thoughts about Barbara Brown Taylor’s An Altar in the World: A Geography of Faith and find that in many ways it supplements Nancy’s own feelings about living a life of faith, conscious of God’s presence everywhere and in everything. 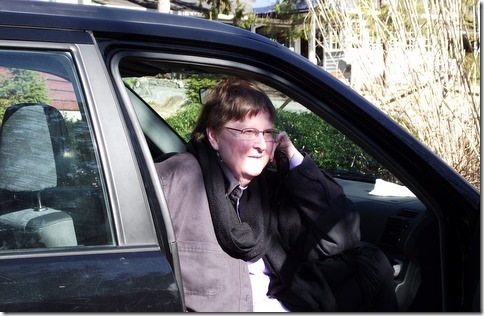 A search on the EEWC-CFT website will also take you to other articles she wrote over the years for Christian Feminism Today and its predecessor, EEWC Update. One of Nancy’s favorite things to do, often spontaneously, on a Saturday morning (or sometimes on a weekday when she didn’t have classes or meetings on the Clemson campus) was to drive up through the scenic mountains to Flat Rock, NC and visit the grounds of the Carl Sandburg Home (part of the National Parks Service) and other places in the area. She would tell me about the spectacular spring and fall foliage along the way and the farms and orchards where she would regularly buy fresh fruit—strawberries, blueberries, peaches, and apples—and about how she had become acquainted with the farm families and had built friendships with some of them. She also got to know the woman who ran her favorite little bakery shop along the way, and the owners of little craft, stationery, and jewelry shops in a couple of small towns. She especially enjoyed the brilliant hues of the autumn mountainsides and loved to look for sales of pumpkins and colorful gourds as well as unusual specialty decorations for one of her favorite holidays—Halloween. She took utter delight in such excursions, and I always enjoyed hearing about them and admired her for taking out the time to get away from the hustle and bustle of urban life and the pressure of university responsibilities to enjoy the rustic beauty of the mountainous countryside. I last visited Nancy in February as I helped her sort through the remaining papers she wanted to be sent to New York and added to her collection already in place in the Archives of Women in Theological Scholarship at the Burke Theological Library, Columbia University. During that visit, we arranged to drive up through the mountains one last time and meet with some of the members of my family who were able to join us. We knew there was a wonderful inn and restaurant that served a fabulous Sunday brunch in Flat Rock, and it seemed an ideal location for our little family reunion, because it was almost equidistant from Steve and Karen’s home in North Carolina and Nancy’s home in South Carolina. My other son, Dave, and his teenage daughter, Morgan, drove over from Charlotte, NC. It was very much a family reunion. The conversation was lively and thoroughly enjoyable for everyone, even though underneath both the serious discussions and the laughter was the realization among all six of us that it would be our last time together. I took a number of photos which I have already shared with the private EEWC group email list; but this past week, Steve and Karen sent me some photos from their camera, taken the same day. This was the first I had seen these photos, and they meant a great deal to me (and I think they will mean much to readers of this blog, too), coming at this time. The one below, so far as I’ve been able to find out, is the last picture ever taken of Nancy. Steve snapped it just as we were preparing to go back down the mountain. Looking at it now, I smile as I remember the day she bought that car several years ago. First, a little bit of background: For some time, I had been urging Nancy to get a CD player so that she could enjoy some CDs that I wanted to send her or had already sent before I realized she didn’t have a player for them. This discussion of CD players had gone on over a considerable period of time. The other picture that Steve and Karen sent from their camera is one of the last ones that show Nancy and me together. Since I have shared with readers of this blog numerous photos from the long-ago days when we were writing All We’re Meant to Be in the early 1970s, I thought you might also like to see this one, taken just two months before she died. Yes, we are an Easter People. The message still holds true. And continues throughout eternity, where time is measureless. Alleluia! In my next post, I’ll continue with Part 7 of this series on “Coauthoring All We’re Meant to Be”and talk about the book’s actual publication after the long delay in finding a publisher. Previous Previous post: Part 6. Coauthoring “All We’re Meant to Be”— Exciting Times in 1973!